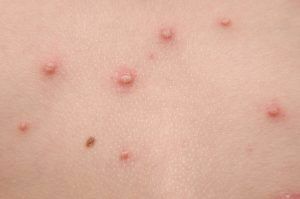 Molluscum contagiosum is a common viral infection that affects children and adults. They are similar to warts in that they are both viral infections and very contagious. Molluscum looks like small flesh-colored or pink dome-shaped growths with a small depression in the center like a donut. They often spread and multiply over time. Treating molluscum contagiosum can help or prevent the spreading of this virus. Treatment options include prescription topical creams, cryotherapy “freezing” or gently scraping the lesions. Without treatment, molluscum can take months or years to resolve. The dermatology professionals at Kentucky Dermatology can assess your skin lesions and discuss your treatment options. If you need help treating molluscum contagiosum; call us today to schedule an appointment (toll-free) at: 800-432-9005.